Everyone here was great to work with. 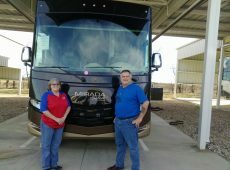 Jordan Buckley did a good job during the sales portion of our time and Omar was awesome during the final walk through of our new Coachmen Mirada. We chose to do business with MHS because they offer the best value and are well recommended. Everyone was so helpful. The customer service was great. We chose to come to MHS because of the price but we stayed for the amazing service. 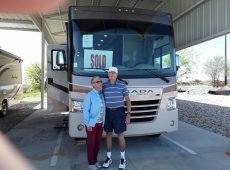 Carl was quick and smooth during the sales and financing process. Chris did a great job during the walkthrough. We will be recommending MHSRV to our friends and family! 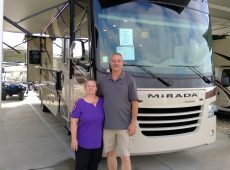 We decided to purchase a Coachmen Mirada from MHSRV mostly becuase of their reasonable prices and available unit. John was good to work with during the sales experience. Good service at MHSRV. 5 stars. Five Stars for MHSRV. Excellent selection, good pricing, and excellent service. J.D. Moore and Chris were both excellent to work with. Everyone is polite and very helpful at MHSRV. I will definitely be a referral of this company. We decided to purchase here because of price and service. Unbeatable prices and excellent service. 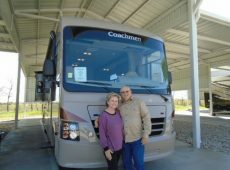 The layout in the Coachmen Mirada feels like home. David Garza was great throughout our interaction, and Travis did a great walk-through. Overall, this has been an outstanding experience! Thank you! I was a customer referral. 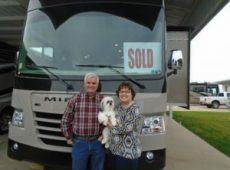 MHSRV offers excellent prices, excellent motorhomes, and excellent service across the board! 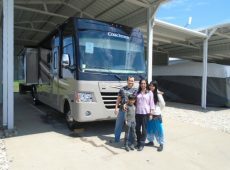 I purchased a Coachmen Mirada and especially like the king bed, larger kitchen, pantry, and washer/dryer options. Brian Kelley was extremely helpful, and offered good follow-up. Collin did an excellent walk through. I received excellent service and will recommend MHSRV to my family and friends! 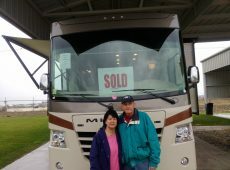 Chose to purchase w/ Motor Home Specialist b/c of the excellent prices, selection, and the salesman. David was very good! Roy did an awesome job walking me through the new coach. The 1 & 1/2 bath and residential fridge are two of my favorite features in the Mirada. Excellent service here and will definitely recommend them to family and friends. I was treated awesome from the 1st day to the last. 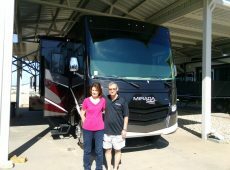 MHS is easy to work with and offers fantastic pricing and top end motorhomes! I like that everything is functional for our needs and love the cargo carrying capacity in the Mirada. Ted was pleasant to work with and Omar did a good walk through. Outstanding service at MHS. We are very grateful for the ease of purchase we have experienced. Thank you Mark for sourcing a lower rate when we did not expect it. Outstanding experience for us. Thank you! 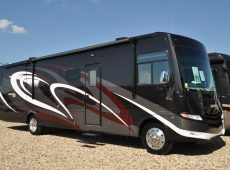 Good prices, very good quality motorhomes, and very good service at MHSRV. Marty did a very good job during my sales interaction and Collin delivered a very good walk thru. I really like the bunks in my new motorhome. 5 stars for MHSRV. Price and inventory is why we decided to purchase here. We knew this dealership was here because of traveling I-35 so much. 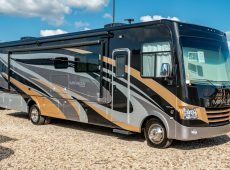 Discounts are good and they offer good motorhomes to choose from. 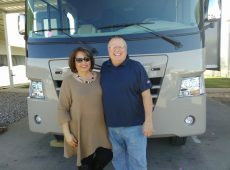 We purchased a Coachmen Mirada and really like the color schemes, bath and 1/2 and the fireplace. John did a good job during the sales interaction. Roy was informative during the final walk through. 5 star rating for Motor Home Specialist. Great, friendly staff at Motor Home Specialist. Mostly did business here because of their excellent prices and selection and their no pressure sales. I really like the layout of the Coachmen Mirada. Marty was easy to work with and Juan did an excellent walk through. I'll be a referral of MHS. It was their selection of quality units, their web page, and their very good prices that had us purchasing from MHS. 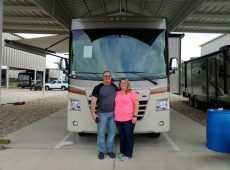 I ended up getting a Coachmen Mirada and especially enjoy the bath and 1/2 and salon bunks. Marty in sales was excellent and Martin was wonderful during the walk through. 5 stars. Keep up the great work! Good price and a nice presentation by David. 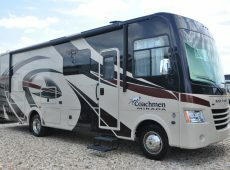 The kind bed and interior in the Coachmen Mirada are my most favorable features of the new coach. Roy did a really nice job during the walk thru and service at MHS was good. 5 star rating. Very good service at Motor Home Specialist and awesome prices. Jimmy did a great job during sales and Collin delivered a good walk through of the Coachmen Mirada. Awesome selection of quality coaches here at MHS. 5 stars. Chose MHS as the place to purchase because of their great prices. Purchased a Class A Mirada and really like the outdoor kitchen and king bed and u-shaped dinette. Justin was good to work with. 5 star rating for MHS. 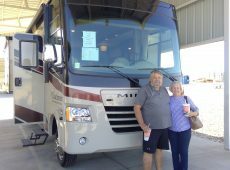 Decided to purchase with Motor Home Specialist mostly because of their great prices. They had a great selection of quality coaches. Went with the Coachmen Mirada and I really like the 2 A/Cs and outdoor kitchen. Mitch and Roy were both great doing business with. I'll be a referral of MHS going forward. Chose to do business here because of the good selection. JD and Roy were both good to work with. 5 stars for MHS. Really liked the freedom to look without sales being pushed. Carl was good to do business with and Roy did a very good job at the walk thru of the new coach. I really like the full side slide in my new Mirada. Will absolutely recommend MHS to friends and family. It was a great experience dealing with you all! Thank you. Everyone was super nice at Motor Home Specialist. Chose to purchase here becuase of their great service. 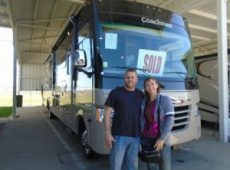 They offer excellent prices and super quality RVs. Ended up getting a Coachmen Mirada and definitely like the 1 1/2 baths and fireplace. Lonnie did an excellent job in sales. Great walk thru, too. Overall, great service received. Will recommend MHS to friends and family. Did business here because of price. 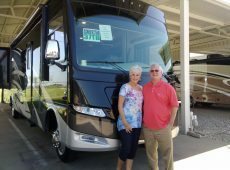 They have great prices and exceptional RVs to choose from. David Garza in sales was very knowledgeable and courteous. Arturo was very pleasant the did a thorough job on the walk thru. What I like most about the Coachmen Mirada are the 2 baths, location of the bunk and the w/d. Great service. 5 stars. Will be a referral of MHS. 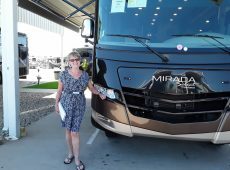 The Coachmen Mirada has all that I wanted! 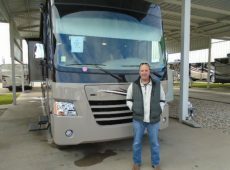 Motor Home Specialist has the best prices, great overall service, and a great selection of coaches. Brandon was easy to work with. Lee performed an excellent walk thru of the Mirada. Great experience! Thank you! It's the value MHS has to offer and Marty, the salesperson that ultimately drove our decisions to purchase here. 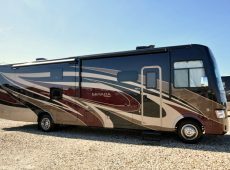 Excellent prices and RVs to choose from at MHS. Was given an excellent and thorough walk through with Colin. Marty and Mark both were excellent. Could not ask for better. Will absolutely be a referral of MHS. Chose MHS as our dealership mainly becuase of selection and price, both of which are A+. We really like the 1 1/2 baths, large shower and bunks in our new Mirada. 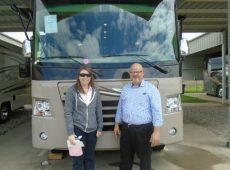 Jordan Buckley was our sales rep and was no pressure but helpful. He was great to work with and helped us both in person and on the phone. 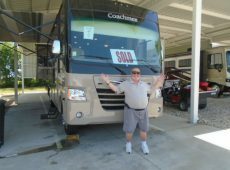 Billy in finance was a lot of help and patient with us during the buying of our new coach. Omar was also helpful during the final walk through. We couldn't have asked for better service. 5 star rating for MHSRV. Will absolutely send our friends and family here. 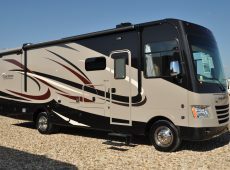 Main reason for purchasing with Motor Home Specialist is their good prices. And MHSRV.com was also helpful. Good, quality coaches here as well as good service. Did business with Justin and Matt - sales process w/ Justin was easy and the walk through w/ Matt went good. I'll be a referral of Motor Home Specialist. Truly enjoyed the people, expertise and the price. 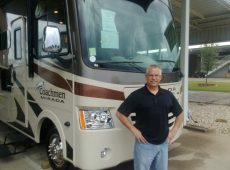 Purchased a Coachmen Mirada through Marty who was pleasant to work with. The sales experience overall was awesome. Steven did a walk through of the unit which was great. He was very knowledgeable. Really like the 2 bathrooms in the unit. Excellent service at MHSRV. Chose MHS because of price and selection, both of which are very good. Really like the quality and 1/2 & 1 full baths in the Coachmen Mirada. Calvin did a great job. Excellent service at MHS. Went with MHS because of excellent prices and customer service. 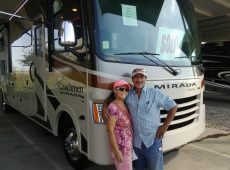 Purchased a Coachmen Mirada from Marty who was pleasant to work with. The sales process was overall awesome. Especially like the 2 bathrooms in the unit. Steven was great as well and very knowledgeable. Truly enjoyed the people, expertise and price. Chose Motor Home Specialist mainly because of cost. 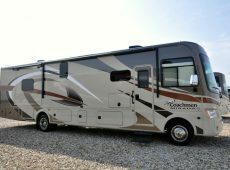 The Coachmen Mirada has lots of room. Worked with Kris and Collin who did a great job. Everything here was great. 5 star rating. Great experience - very nice people. Main reasons as to why we purchased here is because of cost and their service. Easy was easy to talk with and very responsive. Lee did a great job at the walk through. 5 stars for Motor home specialist. Good selection. Good prices. 5 stars. 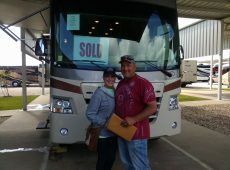 We were referred to Motor Home Specialist. They have competitive pricing and a good selection. 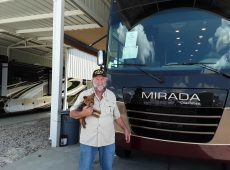 Purchased a 2016 Mirada from Brandon who did a good job during the sales portion. Really like the Tv's on the bunks in the Mirada and the full size appliances. Will be referrals of MHS -- good service here. Purchased here because of their great pricing and service. Worked with Carl in sales, which went smoothly. 5 stars for MHSRV. Great prices and coaches at MHS. Excellent service and an easy sales experience. 5 stars for MHS. Competitive pricing at Motor Home Specialist. Sales with Brian K. went smoothly. Mr. Clemon performed a thorough walk thru. Good, quality service received from MHS. 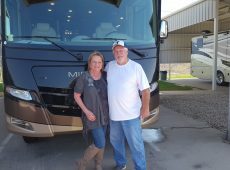 First class operation at Motor Home Specialist. You have outstanding prices and motorhomes. Outstanding service. Robert and Michael were great during the sales and walk thru process of our Mirada. We like the fireplace and extra bath in our new coach. 5+ rating for MHS. 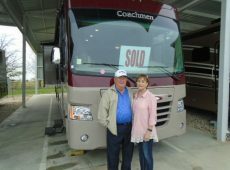 Like the price and location of Motor Home Specialist. Jordan is easy to work with and David did a great job during the final walk through of the Mirada. Decided to purchase from MHS because of their great prices and service! We really liked the bunks, overhead bunk, 1 1/2 bath and the fact the Mirada we purchased was brand new! Just N was efficient in the sales process. The walk through was very pleasant and thorough. 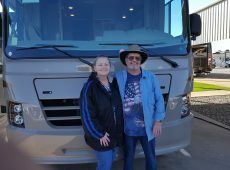 Service from Motor Home Specialist was overall professional. We are satisfied customers. 5 star rating at MHS. The MHSRV.com site was beneficial. 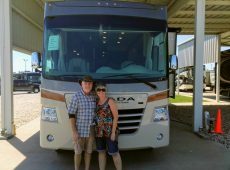 We purchased the Kris did a good job selling us the Coachmen Mirada. The size and layout of the Coachmen are our most favorable features. 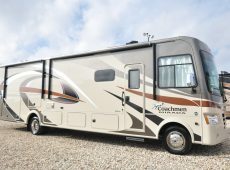 Purchased the Coachmen Mirada and really like the class A jacks, 2 A/Cs, 50 amp, and the king size bed. Brandon was excellent and Collin was also very good. 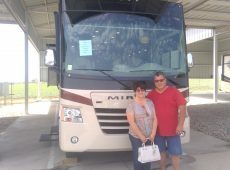 Great pricing and quality RVs at MHS! Nice meal on Saturdays. Very good prices and excellent motor homes at MHSRV. 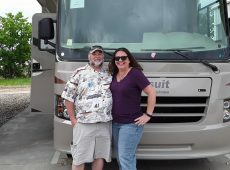 We purchased the Mirada and love the swivel drivers chair, drip down bed, and bunk beds. Brandon (sales) was great - 5 stars. Byrson (final walk through) was also great - 5 stars. Great experience - will recommend friends & family! 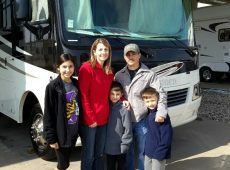 I was extremely impressed with the price and service at Motor Home Specialist. The sales experience was outstanding. Our rep David was patient, available, accommodating and hospitable. Calvin was also very informative. The Mirada's 1 1/2 baths, dark hardwood interior, fireplace, refrigerator, and outdoor TV would have to be some of my favorite features. The online and personal support at MHS was helpful when making my decision to purchase. Can't say enough good things. Have never had a better motor vehicle purchase experience. Biggest reasons for purchasing with you was 1st, price and 2nd it seemed like you had customer service perfected. 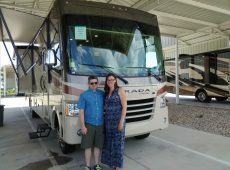 Prices were excellent and seems like you have great choices in regards to the RVs in stock. Ended up purchasing the Mirada and like the bath and 1/2 bath and bunk beds the most. Brandon was fantastic! Arturo was also excellent. Excellent service all around. My son is looking and maybe wants to buy from you. Everyone is so friendly, like one big family. 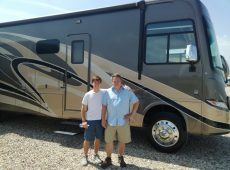 The prices and RVs are excellent and your online advertisement on your website really helped us. The entire experience was awesome. MHS has very good pricing, a friendly staff, and no hassles. Love the Mirada's separate bath and overall size of the RV. Billy was very easy to work with with. Everyone was kind and helpful when needed They did not hassle us at all. 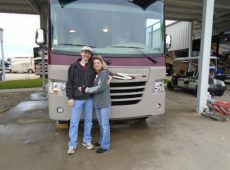 And Lee did an excellent job showing us our new RV one last time. Everyone was very professional and knew what they were doing.